Peridot gemstones raining from the Hawaiian sky from the volcanic eruption….too good to be true, right? Right. You may have heard some ‘fake’ news claiming that this was happening, and maybe you even considered hopping on the next flight to Hawaii to claim some for yourself. But before you do, save yourself the price of that plane ticket and read on. The mineral name for the gemstone that we know as Peridot (gemologists say Per-i-doh, others say Per-i-dot) is Olivine. Olivine occurs embedded in lava rock (among other places) so when there is a volcanic eruption with lava flow, it will naturally bring it to the surface. What you see in the news right now in Hawaii and YouTube are mostly small, broken pieces of Olivine and not the gemstone quality that we know as Peridot. 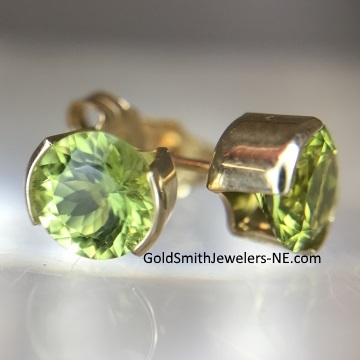 If you are looking for fine Peridot jewelry, you will be much further ahead to visit Gold Smith Jewelers and pick out a piece of jewelry already set with a beautifully cut and faceted Peridot gemstone. If you are looking for a souvenir of the Kilauea volcano eruption, just wait. My prediction is that we will be seeing all sorts of items you can buy containing or made of the volcanic silica ash and especially Olivine. Remember Mount St. Helen’s? ?